Newly revealed parts claimed to be for Apple's next-generation premium iPhone may show a fingerprint sensor component that is expected to be embedded beneath the home button. The new parts were published on Tuesday by Nowhereelse.fr. One of the components shows a round part that could be the fingerprint scanning hardware Apple apparently plans to feature in its so-called "iPhone 5S." The newly revealed part is quite different  and more complex  than the home button component featured in the current iPhone 5. However, there is no identifying information that would confirm the part is necessarily for an Apple product. 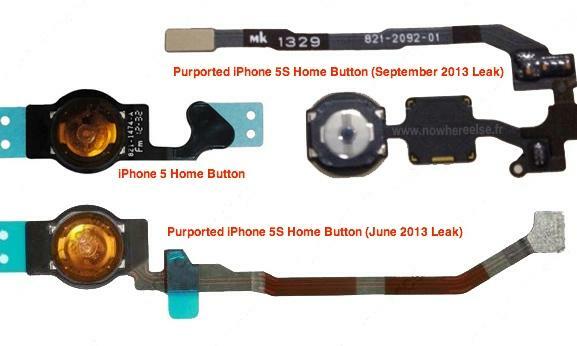 Interestingly, previous leaked home buttons said to be for the "iPhone 5S" did not feature the same design. That's led to speculation that Apple may have excluded the new technology from earlier prototype builds of the device. Last month, another part claimed to be for the "iPhone 5S" suggested a number of internal design tweaks, including a modified home button that could potentially accommodate the rumored embedded fingerprint sensor. Though internal changes are likely, it's expected that Apple's next iPhone will feature generally the same external appearance as the iPhone 5. Perhaps the most convincing evidence for a fingerprint scanner in the next iPhone came from Apple's own iOS 7 beta, where references to a "Biometric Kit" were discovered. A string of text found in Apple's pre-release mobile operating system also described an image of "a person holding an iPhone with their right hand while touching the Home button with their thumb."